(May 17, 2014 Weekend edition) “There is nothing — absolutely nothing — half so much worth doing as simply messing about in boats.” (Kenneth Grahame, The Wind in the Willows). But as boat enthusiasts know, much of the time is spent working on the boat. And that’s not a bad thing either — especially when there’s a boat yard at hand. 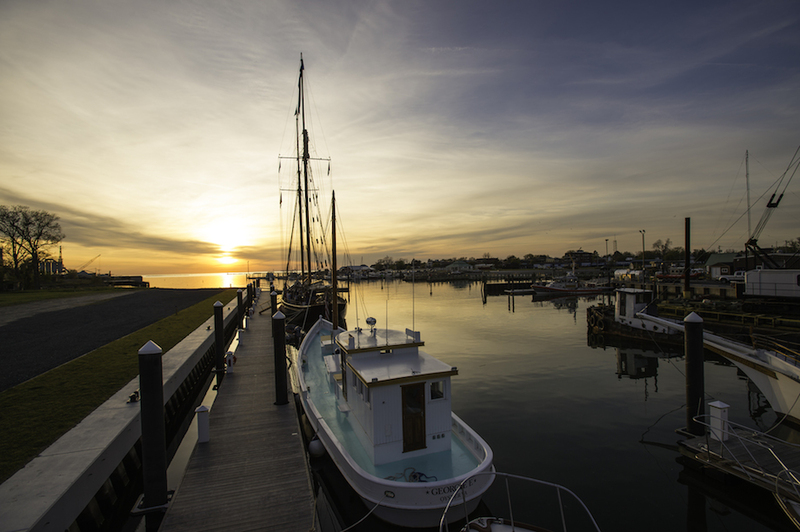 The photo above, courtesy of Cape Charles Yacht Center, belies the activity going on there now — especially Thursday’s soirée hosted by Eyre Baldwin to mark the grand opening of the yacht center. Some 500 guests attended, and Baldwin announced that “Phase Two is now.” He was talking about accommodation for mega-yachts that will require a 300-ton boat lift. That was planned for sometime in the future, but according to Baldwin it’s going to happen now. Meanwhile, the 75-ton-capacity Travel Lift is up and running, and Cape Charles Yacht Center is open for business. It’s a great time to mess around in a boat! Bay Avenue resident Darin Alperin took this very grey photo from his front yard. 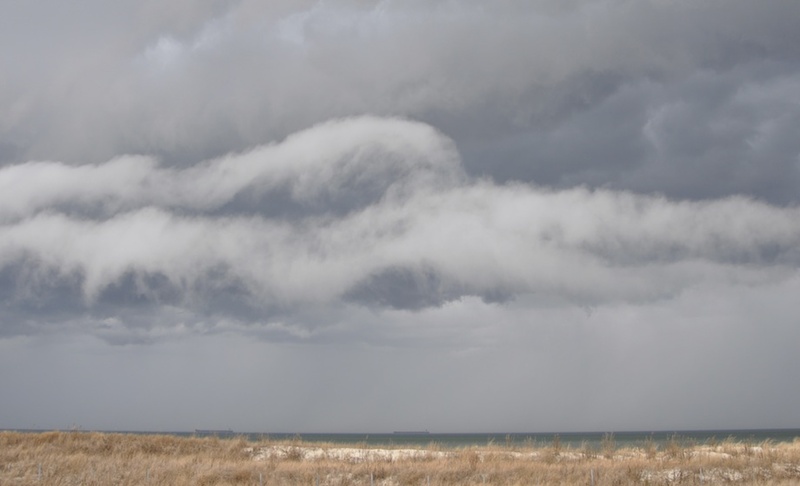 “There was a storm rolling in and you could see the clouds moving in with the colder temperatures. As the cloud reached our house the temperature dropped 10 or 15 degrees. It cannot be seen in the photo, but the cloud in the front was actually a rolling tube,” he explains. WEEKEND: What, Another Snow Scene? 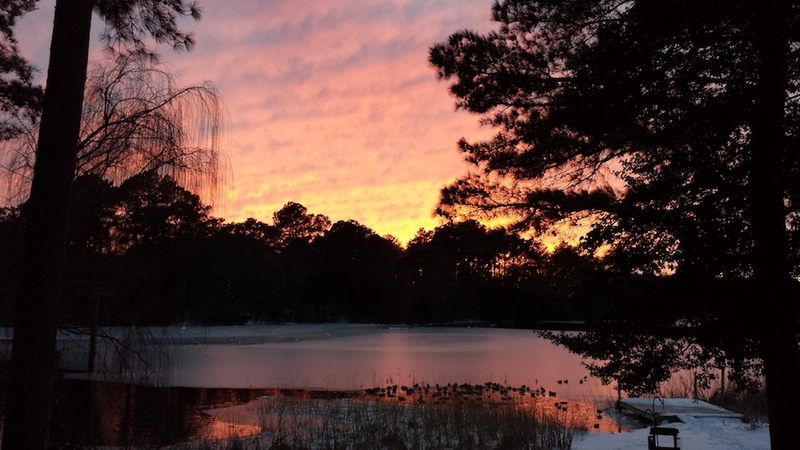 Winter’s not over, and this view of sunset over Mill Creek (off Cherrystone Creek) taken by Mary Lee Wood might be more than a memory: snow is predicted Wednesday, with lows in the 20s the rest of the week. 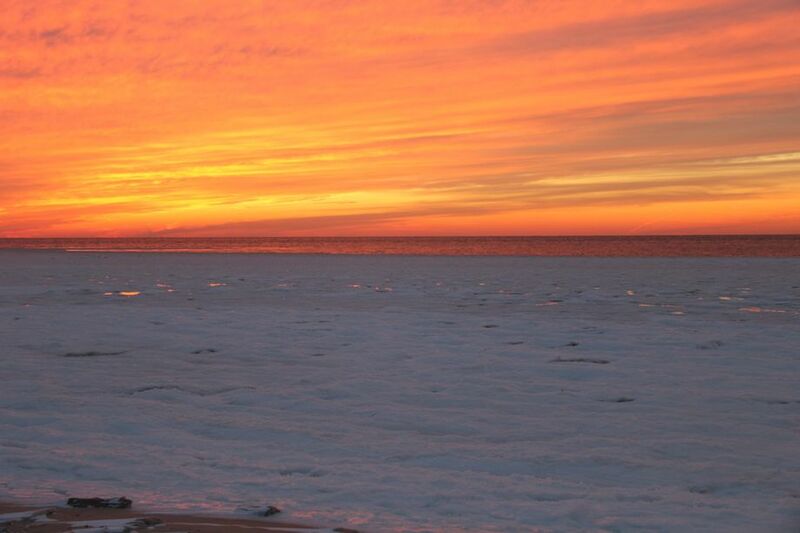 Perhaps the best thing about winter on the Shore is the sunsets — they are definitely more dramatic than in warmer months. Craig Richardson shot this one from his back porch in Seaview. Keep ‘em coming — if they look this good we’ll print them through July! Construction of South Port Investors’ Cape Charles Yacht Center has been ongoing for the past year, but only now has anything risen above the horizon. 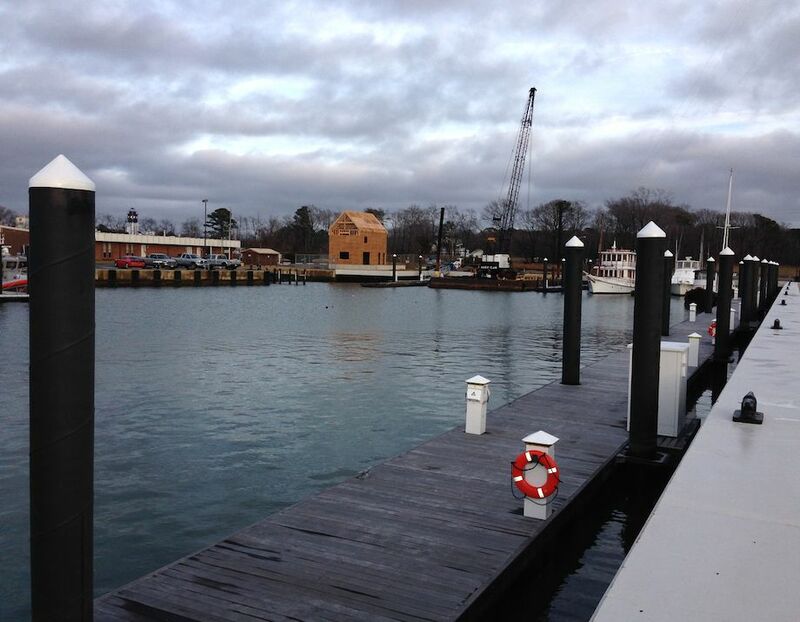 The two-story wooden structure across from the Coast Guard station began taking shape late last month. The first floor is for equipment storage, while upstairs will be an apartment for an on-site manager. Behind the building under construction, a 40-foot high, three-level boatel will offer storage for 33 boats. Drydock yacht repair will take place across the road in the area formerly occupied by the town wastewater treatment plant. South Port is soliciting vendors for a bistro, rental shops, and a bed & breakfast in addition to boat manufacturing, yacht brokerage, boat rentals, sail making, ship stores, and insurance. 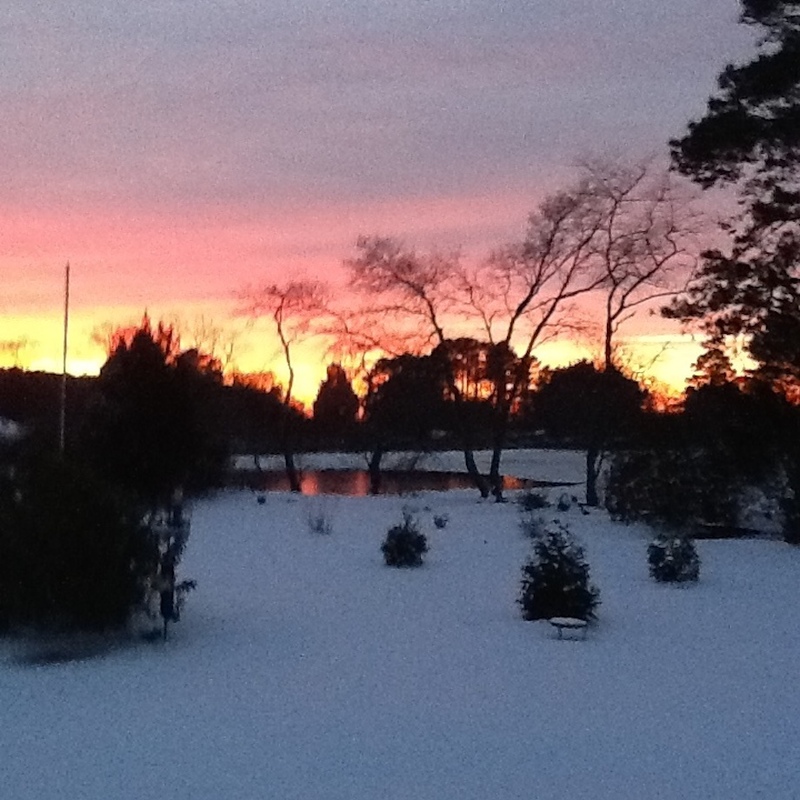 One good thing about winter in Cape Charles: the colder it gets, the more dramatic the sunsets. 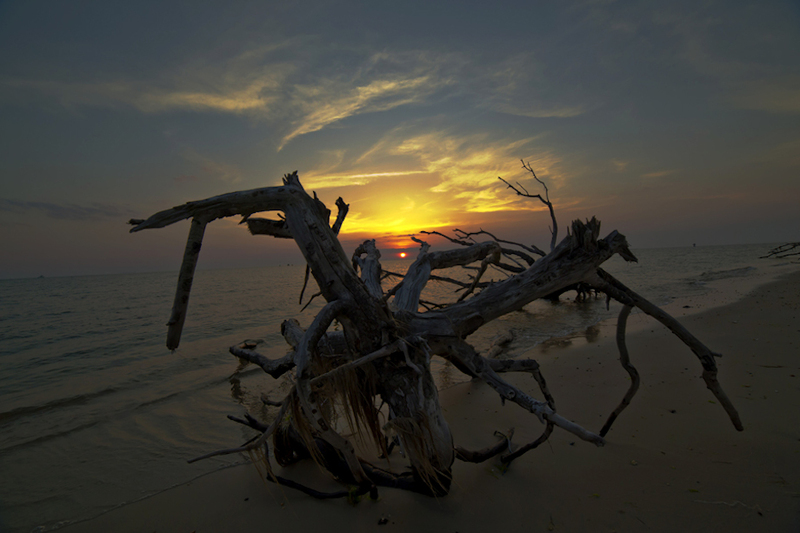 And nobody who truly loves Cape Charles ever tires of seeing a sunset. This one, taken Wednesday at 16 degrees, really is primordial — evoking a time millions of years ago when fire and ice were all the earth knew.